Fire Statistics for Industrial and Manufacturing Properties | The Voss Law Firm, P.C. The National Fire Protection Association (NFPA) released an interesting report in April 2016, which looked at fire data from 2009 to 2013 for manufacturing and industrial properties. The properties they gathered data from included a number of different facilities, including manufacturing, processing, agricultural, utility, distribution, mines and quarries, laboratories, timberland, and more. The data shows some important patterns and trends for fires on manufacturing and industrial properties, which often suffer large-scale losses when fires do break out. Attorney Bill Voss has worked with major commercial policyholders around the nation on fire insurance claims, and he would like to share some of the NFPA’s findings to potentially help you with your loss-mitigation planning for your own property. An average of 37,000 fires on manufacturing and industrial properties were reported to fire departments each year, including 26,300 outside or unclassified fires, 7,220 structure fires, and 3,440 vehicle fires. Heating, tools, and equipment were the top causes of all industrial and manufacturing fires, tied at 14 percent of the total. This included fires started by heating equipment, lighting and electrical equipment, shop tools, cooking equipment, and other industrial equipment. In 17 percent of structure fires, the fire started in workrooms, processing areas, and manufacturing areas. Compared to all structure fires, these were the leading areas where fires originated. Mechanical failure or malfunction contributed to one in every four structure fires, accounting for 23 percent of civilian injuries and 21 percent of direct property damage, on average. On average, while only about 20 percent of all fires on manufacturing and industrial properties were classified as structure fires, 69 percent of the direct property damage in fires was related to structure fires. Vehicle fires were responsible for about 11 percent of direct property damage annually, on average. Vehicle fires were more common on agricultural properties and especially common in October. Annually, there were an average of 18 civilian deaths and 279 civilian injuries associated with industrial and manufacturing fires. Although the NFPA data combines industrial and manufacturing fires in the report, the data did show that about 65 percent of structure fires took place on manufacturing properties. Overall, fires taking place inside structures accounted for the greatest losses, including death or injury and property damage. The NFPA estimates that structure fires were responsible for $704 million in direct property losses for these types of properties each year. 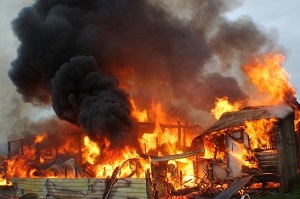 Find out more about how the cause of a fire can impact industrial property insurance claims. Fires are responsible for large industrial losses every year, and many policyholders struggle to get a fair resolution from their insurance companies. The coverage for industrial and manufacturing properties is often very complex, and damages can be catastrophic. Fire insurance claims are sometimes delayed for no reason, unfairly denied, or shockingly underpaid, and it’s up to the policyholder to assert his or her rights and work toward a solution. If you need help after a large-loss fire on an industrial or manufacturing property, don’t hesitate to reach out to the Voss Law Firm at 1-888-614-7730.